Bioconjugation has enabled breakthroughs across many areas of industry and biomedicine. 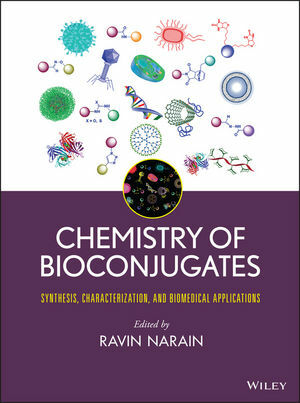 With its emphasis on synthesis, properties and applications, this book enables readers to understand the connection between chemistry and the biological application of bioconjugated materials. Its detailed descriptions of methods make it possible for researchers to fabricate and take full advantage of bioconjugates for a broad range of applications. Moreover, the book sets the foundation for the development of new applications, including assays, imaging, biosensors, drug delivery, and diagnostics. This comprehensive exploration of bioconjugates includes discussions of polymers, dendrimers, lipids, nanoparticles, and nanotubes. References at the end of each chapter serve as a gateway to the most important original research findings and reviews in the field. By drawing together and analyzing all the latest chemical methods and research findings on the physico-chemical and biochemical properties of bioconjugates, Chemistry of Bioconjugates sheds new light on the significance and potential of bioconjugation. The book is recommended for organic and polymer chemists, biochemists, biomaterial scientists, carbohydrate chemists, biophysicists, bioengineers, and drug and gene delivery scientists. RAVIN NARAIN, PhD, is Associate Professor in the Department of Chemical and Materials Engineering at the University of Alberta. He has published more than 100 articles in peer-reviewed journals and is the editor of Engineered Carbohydrate-Based Materials for Biomedical Applications (Wiley). Dr. Narain’s research examines nanomedicine and regenerative medicine, with an emphasis on developing new biomaterials for gene delivery and tissue engineering.